I am in Hutchinson, Kansas, preaching for my friend Pastor Richard Haley who pastors the Riverside Baptist Church. Pastor Haley has been the pastor here for 9 years and is doing a great job of winning souls to Christ. We had 14 saved in total with 2 baptisms this morning. 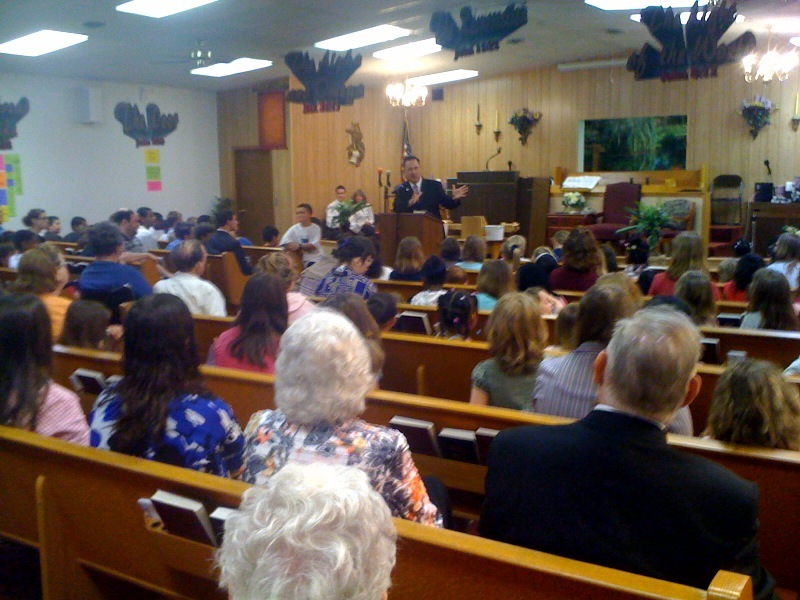 The picture is a picture of the Sunday school at Riverside Baptist. I taught in Sunday school on “Forgiveness” and preached my sermon “Who Shall Be Damned?” We had several adults pray to trust Jesus Christ for payment of their sins. It was great! I was up at 6 this morning, had my quiet time, ate my grapefruit, ate my toast, walked 4 miles on the treadmill, called the Mrs., and reviewed the Sunday school lesson and sermon for today. The pastor gave me a vehicle to drive while I am here and as I was leaving my room to drive to the church I met Sheri DeBold. She works at the Holiday Inn Express where I am staying. I had spoken to her the day before and so on my out I took a little time to speak to her. I gave her a church Gospel tract and told her who I was and why I was here. After a few moments of explaining the Scriptures she bowed her head and prayed to trust Christ for payment of her sins. Wow! GOTTA LOVE SOUL WINNING!